As shown in the diagram below. the Heisenberg Uncertainty and Wave-Particle duality of a Quantum defined as [Psi x Psi*] are directly connected. Both quantum wave-functions Psi and Psi* contain the imaginary i or the teleportation operator according to the Mind-Being Paradigm. 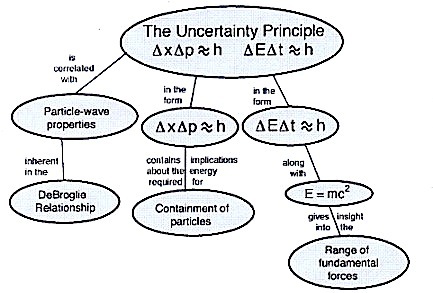 Therefore, the mystery in understanding the Heisenberg Uncertainty lies in the wave-particle concept of [Psi x Psi*], or the crossover at the junction that connects local discontinuity on energy-mass and its connection to non-local information-energy. This is the connection between local discontinuity in space-time (the Particle) and the non-local spaceless-timeless information vacuum (the Soul). Here t is the life-time of the quantum, namely the time of Now for the quantum. Remember, it is at Now that the energy-mass and information energy connects. Within the Matter-Being Paradigm, f is the resonance frequency that produces the collapse of quantum. Remember, this is the resonance between inaudible (in Base-9) and the audible (in Base-10) sound. And E is the information-mass resonance energy. In human Soul-Brain –> Mind connection, the inaudible frequency comes from the heart, while the audible frequency is generated by the brain. Remember, the heart-brain connection lies in the acu-point network referred to as the heart constrictor. This resonance state is a state of Co-creation or Creation. Any other state is a state of uncertainty formed by the Brain Operator and the Heart Operator. A symbolic analogy between a string and a line and between the encoding logic for a vacuum computer and the M-theory unites the existing string theories in 11 dimensions. This is an interesting set of similarities between left-brain logic (String / M-Theory) and right brain logic (I-Ching / Tai Hsuan Ching). Yet, as argued elsewhere, adding the logic component to the wave and particle components, modeled by the vacuum computer with I-Ching logic, completes the wave-particle duality of the quantum and the Standard Model of the Elementary Particles (see other posting). governed by the Logic Potentials, modeled as computer logic. Before concluding this posting, I did a Google search on the question: Is the Universe a Computer. I found that growing evidence in accepting this Information Paradigm than that of Energy-Mass Paradigm in describing this Universe. The answer to the above question is a positive yes, as described in the following two quotations. In physics and cosmology, digital physics is a collection of theoretical perspectives that start by assuming that the universe is, at heart, describable by information, and is therefore computable. Given such assumptions, the universe can be conceived as either the output of some computer program or as being some sort of vast digital computation device (or, at least, mathematically isomorphic to such a device). However, to my surprise, there is no indication on understanding information from the perspective of consciousness, cultural values, and meanings. Information in today’s view has to do with mechanical information, reference frames have to do with mechanical push-pulls, and so on. The view that the Universe is a colossal computer has to do with that part of the Universe that involves data processing, model generations via data fitting and pattern recognitions. This is in fact a small part of the Universe. In short, we are in a living Universe not a Universe of zeros and one’s. We live in a Universe that has feelings. We live in a universe that the observer-observed is local—non-local interconnected—entangled in each other and everything else. It is this conscious Universe that I attempt to model with the self-programmable vacuum computer. Thus, concludes my statements with this posting. However, to complete a first draft of this vacuum computer model, I shall attempt in my next posting to propose the vacuum computer’s living language (QA: What is Vacuum Computer’s Language).